1. Preheat a griddle pan over a high heat or light your barbecue. Finely grate the lemon zest and combine in a bowl with the cheese and plenty of black pepper. 2. Lightly brush the asparagus spears with 2 tbsp oil, place on the hot griddle (or barbecue) and cook for 3-5 minutes, turning occasionally. Meanwhile, toast the sourdough bread. 3. 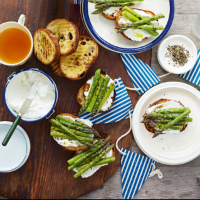 Generously spread the toast with the cheese and top with the warm asparagus. Whisk together the remaining 2 tbsp oil with 4 tbsp lemon juice and season to taste. Drizzle over the asparagus and serve.